Got any Spider Eggs you Don't Want? One researcher is willing to take them off your hands. It's all part of an effort to find out which pesticides work best and which ones are harmful to humans. One researcher is in need of spider eggs, especially brown widow spiders, to help him find out which pesticides work best and which ones are harmful to humans. Daniel Fitch never saw the spider that bit him on his left finger, but the damage was significant. "It just stung like as if I had grabbed a staple moving a piece of furniture, and then it just continued to get worse, and worse, and it started to turn black," according to Daniel Fitch, spider bite victim. The skin around the bite area went from black to bright blue. Doctors took one look at Fitch's hand and began treating him with an anti-venom used for spider bites. "At one point they were talking about amputation if I hadn't gotten there, hadn't gotten there soon enough," according to Fitch. Even though five years have passed…his pain continues, while his medical bills swelled to over $100,000. Fitch is just one example of "why" entomologists at UC Riverside are studying invasive spiders. This summer it's the Brown Widow Spider. Research associate Rick Vetter has been tracking the Brown Widow Spider's descent into southern California, and now wants the public to send him spiders and their eggs sacks. "I'm looking at various aspects of, what habitats are they colonizing, and I'm also looking at parasites that might be in the egg sacks," says Rick Vetter, of the UCR Entomology Department. Vetter's lab is testing the effectiveness of pesticides on the spiders while looking for biological control agents. 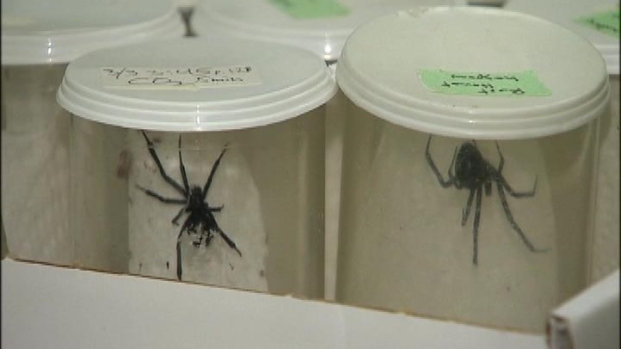 "There may be products out there which are completely ineffective against spiders," says Vetter. "At that point they just spray and spiders walk right out of the foam or the insecticide, and then all you've got now is contamination of the ground." So far, the spiders have been found in agricultural areas and hiding in orange trees amidst the leaves. They have been well established in LA and Orange counties, but have recently turned up in Ventura and Santa Barbara.